Can an art object be taken seriously if also happens to make a person smile? Through sculpture I play with scale, materials and a touch of humour to pose this question visually. My tiny renditions of objects I know intimately through use and experience go beyond the visual. There is a satisfaction in roasting a little leather sausage, trying not to burn or overcook it, while getting the grill marks just right. It makes me feel hungry and it makes me smile. Leather is so close to meat that grilling it feels like telling the truth and telling a lie at the same time. This is the feeling I want to share. An important aspect of my work is for it to be touched as well as seen. The feel of a tiny sledgehammer, its weight, the way it’s become oily from being handled, is as compelling as its visual resemblance to the original. 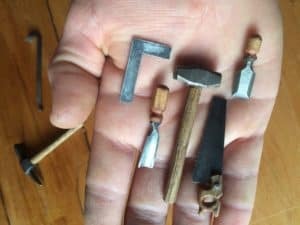 Something few people know, besides the fact that I even exist, is that I am inspired by tools and inventing my own, only to realize they already exist and that I have spent three times as long to reach the same conclusion. If I could have an artistic superpower, it would be to have rocket boots so I can make up for lost time. As a first-time participant at Emma, I am excited for the opportunity to share this aspect one-on-one within a diverse community of artists.